Richardson’s Harley-Davidson® is equally a destination, a retailer and a family. Run by riders, for riders, we’re Australia’s oldest independently owned Harley-Davidson® Dealership with stores in both Hobart and Launceston . We are a family owned business and we love to give back to the community by being involved in various charities every year. Over the years we have donated over $480,000 to local and Australian Charities, as well as hosted and sponsored many events that have helped raise more with third party organisations. Our biggest Charity is Give Me 5 for Kids Tasmania. 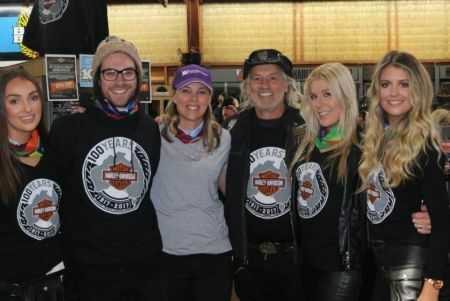 Each year at Richardson’s Harley-Davidson we hold a bike raffle to raise money for Give me 5 for Kids Tasmania. So far we have raised over $120,000. This year we are aiming to raise $100,000 for the charity and we need your help by purchasing a ticket. As I’m sure you are aware it’s for a great cause! Just so you understand what happens with the money raised, Southern Cross collects all monies and is held by them. Hospitals around the state make an application to Give me 5 for kids for new medical equipment and updated play areas for the kids wards. The hospitals provide Southern Cross quotes for what they require for their kids wards. When accepted Southern Cross pays the suppliers for the product directly and supplies the equipment to the hospitals, so no money is lost in admin fees and all money raised goes directly to making sicks kids in our hospitals have a better experience when hospitalised. So the benefits are great, no money sucked out for admin at all, all goes to our sick kids to improve their stay in Tasmanian Hospitals, a very very worthy cause! and many more local charities, community groups, indivuals and schools. We not only do this as a business and as a team but we have great help from our customers and the Tasmanian Community and we thank everyone who supports us and helps us help our community.